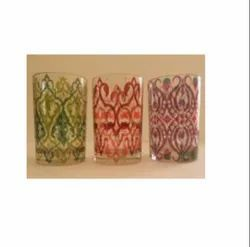 Leading Manufacturer of diamond rim glass candle holder, colour glass candle holder, printed glass candle holder, printed africa glass candle holder, animal printed glass candle holder and peacock glass candle holder from Mumbai. We are engaged in the manufacturing, supplying and exporting of Glass Candle Holder With Diamond Rim. These are very useful for gifting and decoration. These are available in two sizes. These are fabricated by using high quality raw materials. Apart from this, these are offered at very lowest prices. Clear Glass votive candle holders have extensive uses as a decor piece. Just have any idea and this piece as decor will execute all of it. 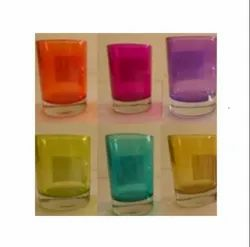 Our company has been esteemed in the domain of manufacture, supply and export of Printed Color Glass holder. These holders are in high demand due to its quality. Besides, these are fabricated by using best quality of raw materials which are made by our experts and available in various sizes. To add on, these are obtained at leading industrial prices to our clients. 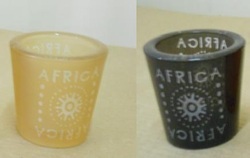 We hold specialization in manufacturing and supplying premium quality Printed Africa Glass Candle Holder. Our company is the leading manufacturer, supplier and exporter of Animal Printed Glass Candle Holder. These holders are in high demand due to its quality, beautiful designs and are manufactured by highly experienced professional experts who have great knowledge in this domain. In addition to this, these holders have awesome look and fantastic colors. Last but not the least these are available at cost effective prices to our customers. Our company has made tremendous breakthrough in the manufacturing, supplying and exporting of Peacock Glass Candle Holder. We offer different ranges of peacock glass holders with superior quality materials. These holders have stylish look and beautiful designs. To add on, these are fabricated by our experts who have enough knowledge of this domain. Finally, these are obtained at nominal prices. Our company is widely recognized in the field of manufacturing, supplying and exporting of Diamond Glass Candle Holder. We can provide proposals to meet your desired specifications. These holders have several sizes, colors and supreme quality. Besides, these have quality ingredients which are purchased from our reliable vendors. Finally, these are available at competitive price to suit the pocket requirement of various customers. Our company is widely acclaimed in the manufacture, supply and export of Peacock Range Big Bell Glass Holder. 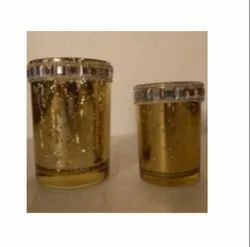 These candles are very beautiful with superior quality materials. Besides, these are fabricated by our expert team who has great knowledge of this field with advanced technology. In addition to this, these candles burn in consistent way and are absolutely attractive. Last but not the least, these are offered at nominal prices.